Here’s a brief summary of each Instore report and its value. The Daily Performance report is the first report you see when logging into our Office portal, under Reports/Daily Performance. 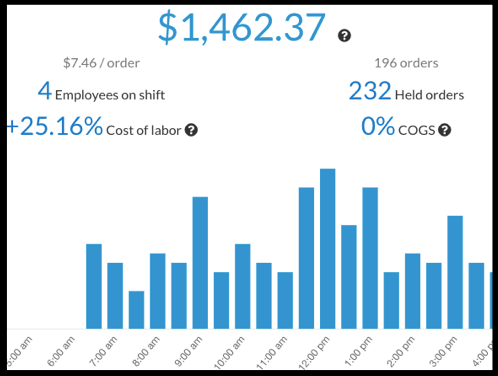 It’s a great dashboard for your business, highlighting sales for the day, clocked in employees, labor cost and cost of goods, as well as transaction activity throughout the day. You can view daily performance for any day and compare that day to the week or year before. This report details customer activity and provides a list of your top customers. Coming soon we’ll be adding more filters plus the ability to export your complete customer list. The Profit and loss report can be found at Reports/Profit and loss, and is great for reviewing business performance over a week, month, or longer period of time. It’s also the place to go for sales tax reporting, gift card loads, and other important metrics. You can compare profit and loss across different reporting periods by using the date picker. Finally, this report can be exported to .csv file format for importation into your account program of choice. 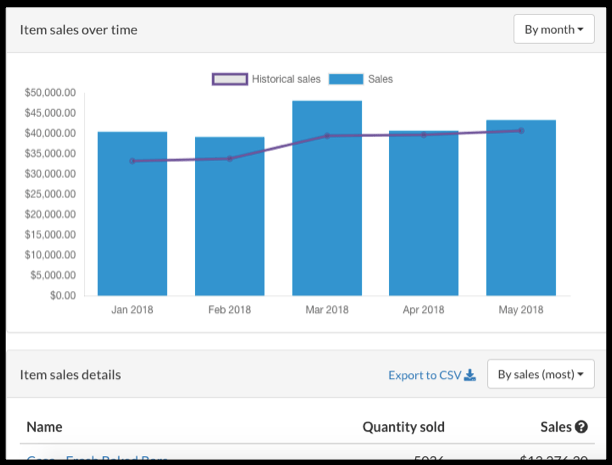 You can export summary data (ie the month of May) or daily data (ie the 31 days in May). This report provides real time information on in-stock quantities for any items you are tracking for inventory purposes. You can sort the report by category to identify which items are most at risk of becoming out of stock and to assist with re-ordering. Instore allows you to identify a Target Quantity when turning on inventory tracking and calculates restocks based on the difference between actual inventory and your target quantity. This report ranks your employees across a series of security events taking place on your Instore tablets, such as refunds, paid outs, order clears, etc. The first part of the report is a graphical ranking, the second provides the actual events that occurred with time stamps. 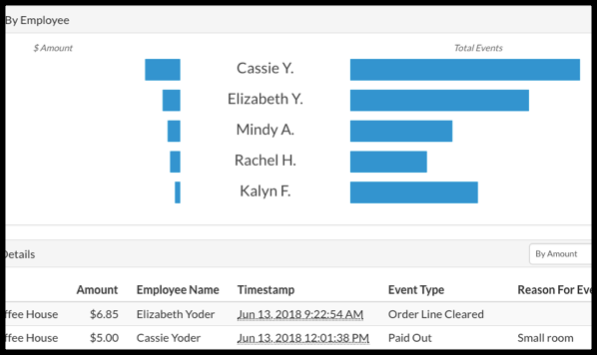 Be sure to take advantage of the filters on this report to isolate individual employees as well as specific security events for any period of time. If an event is listed with an “Unknown” employee, you’ll need to turn on the Pinpad for this action under Location settings. These reports are designed to provide greater insights into how items, categories, modifiers, and discounts are performing across various time frames. 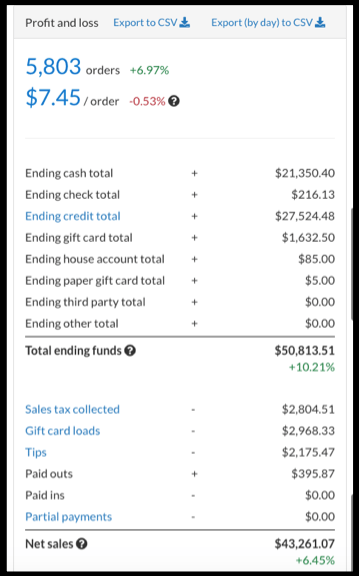 You can view each report daily, weekly, or monthly, and even narrow your reporting range to certain hours of the day, like a view of breakfast sales after noon or the popularity of a Happy Hour discount. The Orders report lists all orders on your Instore POS for any time frame. You can search for a specific order, view all orders under a single customer record, or see all cleared orders by an employee. View receipt detail on each and every order by clicking the order number. Be sure to take advantage of the Change filters button to sort orders just so. This report is relevant if you use Strict cash management on your Instore tablets. 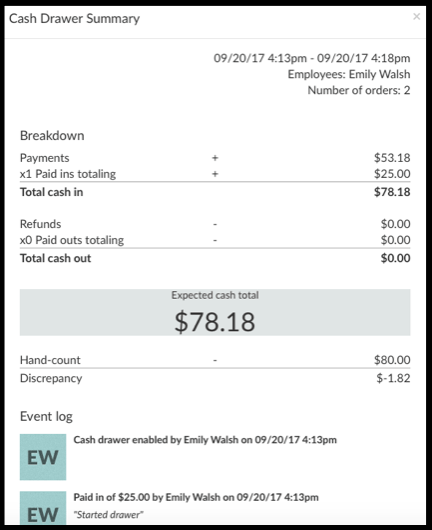 With Strict cash management, cashiers run cash drawer summaries when they close out a drawer at the end of their shift. These summaries are visible on Office under Reports/Cash drawers. See of summary of your payroll information for any pay period at Employees/Payroll on the Office portal. Make sure you select the time range you want to review. Note that you can click View Shifts for each employee to confirm proper time keeping. If a shift has a symbol, one of that employee’s shifts stretched across two pay periods. You can export this report to a .csv file for importing into your payroll system or email the report to an accountant. See of summary of your employees’ shifts for any time period at Employees/Shifts on the Office portal. Any shift highlighted in red has a longer-than-expected time range while any shift highlighted in blue has no clock out information. You can edit any shift by clicking the symbol. You can export this report to a .csv file for importing into your payroll system or email the report to a team member.